The Civil Aviation Authority has said it is taking legal action against Ryanair over its refusal to compensate thousands of UK-based customers. However, Ryanair argues the strike action amounts to "extraordinary circumstances" and that therefore, it does not have to pay. More Ryanair passengers have put in compensation claims for cancellations or delays to arbitration this year than any other airline. Figures from the Alternative Dispute Resolution (ADR) service showed the airline accounted for the largest proportion - 30% - of all appeals. In the first nine months of 2018, it received 22,159 complaints, but only processed 1,347 of 6,653 Ryanair cases. According to the CAA, under EU legislation, passengers are allowed to make an EU261 claim when flights are delayed by three hours or more, cancelled or when they are denied boarding. Ryanair, like other airlines, was signed up to abide by ADR decisions. Ryanair has now told the CAA that it has terminated its agreement with ADR. "As a result of Ryanair's action, passengers with an existing claim will now have to await the outcome of the Civil Aviation Authority's enforcement action," the CAA said. Helen Derbyshire, 21, from Manchester, had to cut short her holiday in Berlin in September with her sister Abigail, 18, when their return Ryanair flight was cancelled because of strike action. She has since attempted to claim compensation herself, as well as through a claims company, Resolver, but Ryanair has refused. She told the BBC: "We were really disappointed, because we'd been looking forward to it all year. "Ryanair offered us a flight back the following week, but due to commitments with work and college, we had to fly back the next day. We also did not have enough euros to stay at our hotel for an extra two nights. "We were very upset, as we had saved for months for this holiday, and we lost a lot of money on our hotel, as we had to check out two nights early. "On top of this, we only had two full days in Berlin, out of the five we should have had. "We were very worried and not sure what to do. Ryanair told us not to ring them, as they said the phone lines would be very busy, so we had to work it out for ourselves. "I am very unhappy about the service we received from Ryanair. I have documents from Ryanair giving us two different stories about why they cancelled our flight, and evidence that they have refused to give us any money back." In response to the CAA's announcement, a Ryanair spokesperson said: "Courts in Germany, Spain and Italy have already ruled that strikes are an 'exceptional circumstance' and EU261 compensation does not apply. We expect the UK CAA and courts will follow this precedent." Consumer rights organisations have welcomed the CAA's move. Rory Boland, Which? 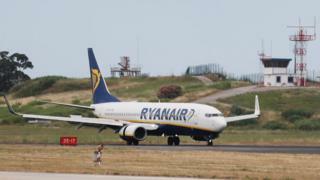 travel editor, said: "Customers would have been outraged that Ryanair attempted to shirk its responsibilities by refusing to pay out compensation for cancelling services during the summer - which left hard-working families stranded with holiday plans stalled. "It is right that the CAA is now taking legal action against Ryanair on the basis that such strikes were not 'extraordinary circumstances' and should not be exempt, to ensure that the airline must finally do the right thing by its customers and pay the compensation owed."